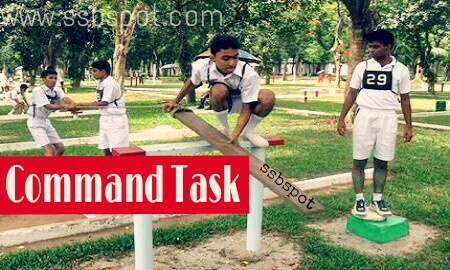 What is Command task ? Working in a group Progressive task or in a half group task some candidates feel that they had ideas but couldn't do the task in the manner they wanted to do. For this command task are there to check individual candidates ability to do the task. In command Task, each candidate is made as a commander of one particular task. This command task consists of only one obstacle. All the rules are applicable except Group rules. Time given to you to do the task is 10 minutes only. Being The commander you can choose any two friends to help you with the task. Hence in the command task you have two roles to perform. The main role is that of the commander and the secondary role is that of the subordinate. Thereafter the GTO will call you in a random manner and one by one put you through the task. This is the only time when you and the GTO will be all alone on the ground. The GTO may ask you some questions related to PIQ. Watch the helping material and structures carefully while GTO explaining to you. Choose two friends quickly. These candidates should be those candidates who are doing well in the group. GTO will ask you, why have you chosen this candidates. (preferably one of the candidate must be thin and tall and the other slightly heavy). Once your subordinates come to you, place them next to start line and do a small briefing as - chest number 1 and 2 this is our task. - explain the helping material. - explain the start line and finish line. - rules you all know, let's start. As commander you must be able to solve the task assigned to you. As commander enter the task first and remain in a position from where you can exercise and enroll over man and material. Don't ask any suggestion from your subordinates as you are the commander you have full responsibility to do the task. If any subordinate talks, ask him not to speak unless spoken to. Leave an impression of being an effective commander. As a commander you will be the centre target for GTO. so plan your task carefully. Don’t put your hands in pocket and just pass the orders,enter the task first and remain in a position from where you can exercise and enroll over man and material. Cheer your subordinate and keep motivating them, praise their good work. If you find your subordinates are not doing accordingly then calmly point them and correct them. As subordinate you are also under observation. So obey all the orders of the commander. Do not help the commander directly or indirectly. If the commander asked for a suggestion and the GTO remains quite then you may give him an idea. Leave the impression being a good subordinate. Command task is preselected and different for every candidates. a good candidate will be given difficult command task. GTO will not only spend more time with such a candidate but ask him for more and more ideas. The GTO will hardly spend any time with a weak candidate and made not ask him any ideas. During command task the GTO may ask you about preparation and coaching. If you have taken coaching then be honest tell everything to GTO as you cannot hide anything in a SSB interview. Your preparation and coaching shows your organising ability and reasoning ability.